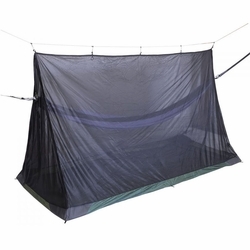 ENO Guardian Base Camp Bug Net. Eagles Nest Outfitters. The Great Outdoors is calling, but so are the mosquitoes. Never let them kill your buzz again with the Guardian Basecamp. Offering 360-degree insect protection, a bathtub style floor, and a cavernous interior space with luxurious full length zippered entry, the Basecamp allows you, your buddy, and your dog to stay safely and comfortably out of harm's way. With easy setup and breakdown, and a convenient stuff sack to carry your bug-free-fortress in, anywhere is hammock territory with the Basecamp. Dimensions	(L x W x D) 9'3" x 4'2" x 4'9"